In the first nine months of 2016, international freight forwarding and logistics company Panalpina recorded a slight increase of EBIT and consolidated profit, when adjusted for the second-quarter restructuring provision of CHF 26 million. EBIT reached CHF 93.6 million and the consolidated profit CHF 72.6 million. Against the backdrop of receding markets in air and ocean freight, Panalpina’s volumes increased by 9% in Air Freight while they decreased by 9% in Ocean Freight. Logistics continued its positive development on the EBIT level. Group gross profit decreased 1% to CHF 1,091.7 million in the first nine months of 2016 (YTD 2015: CHF 1,107.3 million). Total operating expenses amounted to CHF 961 million, 2% less than in the same period of the previous year (YTD 2015: CHF 975.8 million). 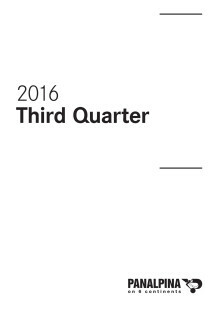 Adjusted for the oil and gas related restructuring provision of CHF 26.1 million in the second quarter, EBIT reached CHF 93.6 million (reported YTD 2016: CHF 67.5 million; YTD 2015: CHF 92.4 million). The adjusted EBIT-to-gross-profit margin came in at 8.6% (reported YTD 2016: 6.2%; YTD 2015: 8.3%) and the adjusted consolidated profit amounted to CHF 72.6 million (reported YTD 2016: CHF 46.5 million; YTD 2015: CHF 69.3 million). Panalpina’s Air Freight volumes increased 9% in the first nine months of 2016, while the market decreased by an estimated 1%. The recently acquired perishables business accounted for about 6% volume growth and new business accounted for the remaining 3% growth. Gross profit per ton decreased 5% to CHF 678 (YTD 2015: CHF 715), resulting in a total gross profit of CHF 453.4 million (YTD 2015: CHF 439.7 million). Air Freight achieved an adjusted EBIT of CHF 72.6 million (reported YTD 2016: CHF 60.0 million; YTD 2015: CHF 67.6 million), while the EBIT-to-gross-profit margin for the first nine months of 2016 increased to 16.0% (reported YTD 2016: CHF 13.2%; YTD 2015: 15.4%). Panalpina’s Ocean Freight volumes from January to September 2016 decreased 9% year on year while the market shrank by an estimated 1%. The decrease was mainly due to significantly lower volumes in oil and gas since the beginning of the year as well as a discontinued high-volume contract. However, gross profit per TEU increased 5% to CHF 314 (YTD 2015: CHF 300), resulting in a gross profit overall of CHF 345.0 million (YTD 2015: CHF 362.2 million). Adjusted EBIT in Ocean Freight amounted to CHF 16.0 million (reported YTD 2016: CHF 6.3 million; YTD 2015: CHF 22.8 million). The EBIT-to-gross-profit margin came in with 4.6% for the first nine months of 2016 slightly below last year (reported YTD 2016: 1.8%; YTD 2015: 6.3%). In Logistics, gross profit decreased 4% to CHF 293.3 million (YTD 2015: CHF 305.5 million) and adjusted EBIT increased to CHF 5.0 million for the first nine months of 2016, compared to CHF 2.0 million in the same period of last year (reported YTD 2016: CHF 1.2 million). Panalpina verzeichnete bis September 2016 eine leichte Zunahme bei Betriebsergebnis und Konzerngewinn (bereinigt um einmalige Sondereffekte). Der EBIT betrug CHF 93,6 Mio., der Konzerngewinn CHF 72,6 Mio. 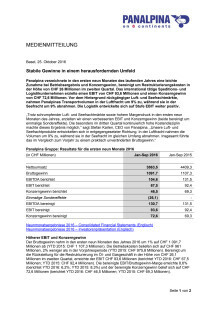 Bei rückgängigen Luft- und Seefrachtmärkten nahmen die Transportvolumen in der Luftfracht um 9% zu, nahmen aber in der Seefracht um 9% ab. Die Logistik entwickelte sich beim EBIT weiter positiv.